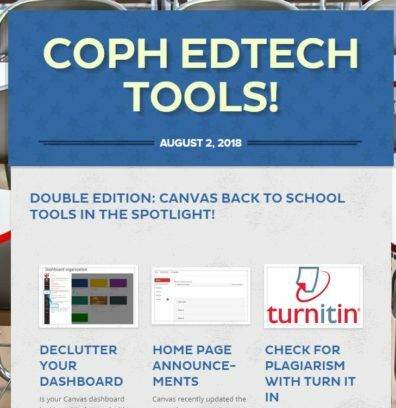 It is back to school time, and the COPH EdTech Newsletter has double the Canvas tools to help you get ready! In this edition, you can learn how to declutter your dashboard, add announcements to your home page, and check assignments for plagiarism using Turn It In. If three tips aren’t enough, you can also learn how to add or remove student grade distribution graphs in the grade book, create a grade column for participation points and weight your course grades!